Ask an American “who invented animation” and the most likely response will be “Walt Disney.” Students of animation history know better, of course — but while Disney contributed significantly to the development of the form, his most permanent legacy may be the tireless self-promotion with which he stamped his own name on animated cinema. Foremost among Walt Disney’s gifts was his facility with storytelling, so it’s no surprise that to this day, millions accept as historical fact the studio’s own carefully constructed narrative about its role as engine of technological progress in animation. But in the silent era and well into the 1930’s, animation’s technology leader was the Fleischer Studio; other studios, including Disney, struggled to keep up with Fleischer’s visual and mechanical inventiveness. And while Disney, obsessed with realism, strove to create an environment in which rigidly contained characters behave according to strict visual, narrative, and social rules, the principles at work in Fleischer-space are the exact opposite. Betty Boop and Popeye inhabit a profoundly rubbery world, in which the fourth wall is full of holes, distinctions between human, animal, vegetable and inanimate taxonomies are unstable, and the boundary between cartoonal and real space is up for grabs. Fleischer deployed a number of techniques in the service of this anarchic cinematic vision, among them rotoscoping (patented by Max Fleischer in 1917); integrating live action shots; and using still photographs as animation backgrounds to create the illusion of cartoon characters inhabiting a real-world space, as in the opening scene of the astounding Betty Boop short Ha! Ha! Ha! (1934). The most technologically ornate item in Fleischer’s toolbox was the setback camera (sometimes erroneously called the ‘stereoptical process’), used in a number of shorts and in the feature film Hoppity Goes To Town (1941). The setback is often confused with Disney’s multiplane camera. Both systems evolved somewhat contemporaneously, and both create the illusion of dimensional depth, but functionally they have little in common. The setback rig consists of a forced-perspective, miniature set mounted on a turntable, serving as background to the cel art held in a vertical glass platen, and a horizontal animation camera. The turntable is rotated incrementally behind the cels, creating the effect of a “tracking shot” — the 2D animated character, in a side-view walk cycle, traverses a realistically proportioned (but still recognizably Fleischeresque) 3D environment which moves perspectivally across the background. Getting the setback rig to work at all must have been a major technical feat — the lighting challenges alone seem headache-inducing — and it’s easy to imagine that 1930’s audiences, unaccustomed to full 3D motion in cartoons, were amazed by the onscreen results. Yet the scenes in which the studio deployed setback shots seem chosen at random. Setback made its public debut during a fast and comical chase scene in the Popeye short For Better Or Worser (1935), but in Li’l Swee’ Pea (1936) the setback shots accompany such humdrum, utilitarian scenes (Popeye walking; Popeye pushing stroller) that the overall effect is underwhelming. Setback shots in the color two-reeler Popeye the Sailor Meets Sindbad the Sailor (1936) are more sophisticated; some feature an additional foreground layer of sliding 3D scenery between camera and platen, with the nearer objects convincingly off-focus. The animators found new ways to make the drawn characters interact spatially with the backgrounds: Popeye climbs a staircase (walking ‘between’ two balustrades built into the turntable) and Bluto convincingly enters a 3D cave. Some shots vary the turntable velocity, with the animation timed accordingly. In one of the better-executed gags, 2D Bluto plunges his hands into a 3D treasure chest and scoops out handfuls of 2D gems. The lighting crew evidently struggled to eliminate shadows and glare from these more complex shots, sometimes without success. 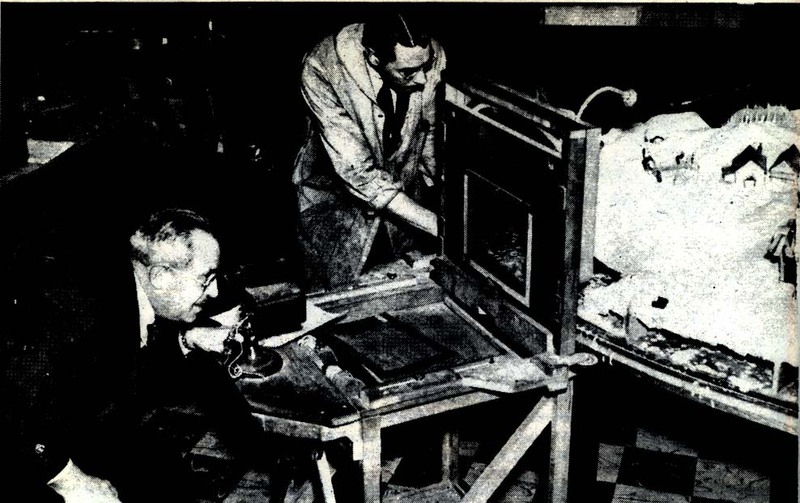 Disney’s multiplane camera, though technically complex, only shot 2D artwork. Fleischer attempted something more ambitious — in-camera compositing of 2D and 3D animation — decades before it became possible to do so optically or digitally. Perhaps setback was born too soon; despite its heady promise of merging the 2D and 3D worlds, the system was a one-trick pony. The technical limitations became narrative ones: since the forced-perspective effect depended on a fixed distance between the camera and turntable, setback was constrained to panning along the x-axis — an efficient but not very engaging way of moving a character from here to there. If Fleischer ever attempted moving one of the setback elements in z-space, the results must have been judged unfit for presentation. The more flexible multiplane system allowed z-axis camera moves which drew the audience into the pictorial space. But Disney didn’t overtake Fleischer just by stumbling upon superior filmmaking machinery — history is full of bad technologies that prevail over better ones — but by harnessing all of the studio’s resources, including multiplane, to build a triumphant narrative about technological progress. Disney leveraged its story-structure chops both on and off the screen: not only did the multiplane camera highlight important moments in a given film’s narrative with its swooping spatial moves (announcing its presence in Pinocchio, for example, with soaring flocks of birds and tolling church bells), it also played a key role in Disney’s meta-narrative about how technically challenging the films were to make. Over the following decades, the studio unspooled this story over and over, in countless promotional ‘making-of’ films shown during Disney’s TV program, and in every other known communication medium except possibly Morse Code and smoke signals. With every new feature Disney unleashed increasingly baroque publicity storms, always emphasizing how hard everyone worked to make the picture: to what distant locales the artists traveled; what species of exotic fauna the studio installed in its in-house zoo for visual reference; how many trainloads of paper and ink were consumed during production, and so on. That any of this was necessary underscores the lasting irony of Disney’s achievement: in the service of realism, Disney drove his artists and technicians to previously unattained levels of craft, with the result that audiences forgot they were watching animation and had to be constantly reminded, through channels external to the films themselves, how hard it was to create the illusion. Unlike Fleischer’s animators, who couldn’t stay out of the picture, Disney’s crew did their jobs so well that they made themselves disappear. If the sets on each row were tilted back, would they appear to be closer? hi Brett — no, probably not — it would just create a distorted-looking environment. Think of a forced-perspective or anamorphic miniature set, like you might find in a puppet show. By exaggerating the scale of objects (bigger in foreground, smaller in background) you create the illusion of greater depth than really exists in the scene. It all converges down to a single vanishing point at the phony ‘horizon’. The setback rig does this on a turntable that spins during shooting, with the pivot point of the turntable serving as the vanishing point. When you look out the window of a train travelling through a flat landscape you see exactly this effect. I need confermation on the difference between the rotograph, setbacks and the stereoptical process. Every site has different info. Do you have any ideas? You can find patent drawings online for the setback system (described above) and for the rotoscope, a system for tracing live action film onto animation paper (there are lots of ways to do this digitally too, though obviously these didn’t exist in 1917). I can explain the use of the term “Stereoptical Process.” It is credited on the original openings of the cartoons, displaying the Patent Number for the device. The term is a play on the old Stereopticon slides of the Victorian era. In the studio, according to the production manual and production records, the in house reference to the type of background to be used was “Setback,” a shorthand for background set. These, as you know were models. The advantages that this system had over Disney’s Multiplane was that its use of forced perspective on the model sets allowed for everything to move together in correct parallax. The Disney Multiplane had to have each level calculated and moved at separate increments, employing a Camera assistant for each level, and each level requiring lighting. Also the Multiplane took up more space, being a vertical device. Also, the Multiplane was limited moving in with levels moving on vertical Pans. Fleischer’s Steroptical device was more versatile. Not only could the camera could move in along with the rotating Pan effect, it could tilt up or down as if going up in the air from a plane or a construction elevator. It could also change from day to night using the same model set simply by changing the lighting. Yes, the term “Stereopcial Process” is correct. All of this and more is explained in my book, THE ART AND INVENTIONS OF MAX FLEISCHER: AMERICAN ANIMATION PIONEER, coming this fall from McFarland & Company books. My first exposure to what I believe is the “setback” camera process is in the opening sequence of the Betty Boop cartoon “Judge for a Day”. When Betty leaves her house and walks down the street, everything in the background, especially the rosebushes she walks past, are in 3D. The first time I saw it, it blew me away. I couldn’t believe they could do that in the early 1930s. That cartoon is available to see online whereas the Popeye cartoons referenced above have all been pulled, I assume for copyright reasons. I do remember the Popeye cartoon scene, referenced above also, where Bluto plunges his hands into a 3D treasure chest. That was pretty impressive too. Finally, as stated above too, it is interesting that these setback camera shots are seemingly placed randomly in the cartoons mentioned and the 3D effect is only a brief sequence in each cartoon. As impressive as the effect was, it was time consuming and complicated to shoot. The animation was usually planned for one level, meaning one cel level change for each exposure. There were also more drawings made for these scenes. They were snot on “ones,” which means that a new cel had to be made for each incremental move of the background to maintain the impress of contact without the impression of “slipping.” Rare did the shoot animation on “twos” using the Setback camera. The slow skipping along seen in SOMEWHERE IN DREAMLAND is a rare example where the animation was on ‘twos,” however. The Color Classic, MUSICAL MEMORIES has the most extensive use of The Stereoptical Process, one in every scene. This fit the film since it was built around the old couple looking at the old fashioned Stereopticon 3D slides. There are something like 18 of these scenes and in color.